Production & Low-Volume Custom Plastic Injection Molding and CNC Machining in 1-15 days. We guarantee your mold for life. That means there's no quantity limit for the life of your project. How can we make this claim? 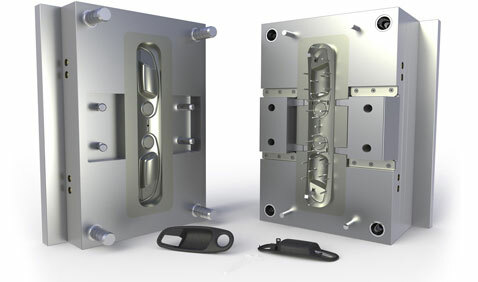 Our injection molds are built with extreme high tolerance tool metal conditions. This eliminates the metal to metal shock during the molding process that reduces the mold life and usually results in mold repair. We use only quality mold components. Our injection molding company has its own tooling room where each mold is maintained every time it is run. Other companies do not maintain their molds until the tool breaks, then they call you and tell you the life of your tool is running out. We run your parts on all electric molding machines. These machines are equipped with mold protect sensors that eliminate over clamping or smashing of parts into the mold. We use our Proprietary Process Engine to process every part. This eliminates over shooting the part and applying too much pressure to sensitive mold features. We personally stand behind every mold we build and run. Simply put you will never get a mold repair or rebuild invoice from us for the life of your project (unlimited Parts). Xcentric guarantees no quantity limit for the life of your project. Mold and Parts must be manufactured at our facility. The only thing that voids the warranty is if the mold leaves our facility. It’s that simple. We build it, we run it and we supply parts. In addition, we are ISO, ITAR registered and UL-approved. Above all, we stand behind it!